Acute, single ingestions (where entire ingestion occurs within an 8-hour period). Absence of formulations or coingestants that alter absorption and bowel motility (e.g. anticholinergics, opioids). Get an accurate time of ingestion: the Rumack-Matthew nomogram is entirely dependent on knowing time of ingestion. Start NAC treatment within 8 hours post-ingestion to decrease the risk of hepatotoxicity (AST or ALT > 1000 IU/L). In patients presenting 8-24 hours post-ingestion, start NAC while awaiting the acetaminophen concentration; once this is resulted, NAC can be continued or discontinued depending on the level. The Rumack-Matthew nomogram is the most sensitive risk prediction tool in medical toxicology. It identifies patients at very low risk of developing hepatotoxicity after acetaminophen overdose and who do not require NAC. All patients above the nomogram line should be treated with NAC to decrease the risk of developing hepatotoxicity (See Evidence). Acetaminophen is widely available in prescription and over-the-counter medications, either as single agent or combination products (e.g. dextromethorphan, opioids, diphenhydramine). Maintain a strong index of suspicion for acetaminophen toxicity in all patients with intentional drug overdose and those with therapeutic misadventures (e.g. taking excessive amounts of a single product, or using recommended doses of several different acetaminophen containing products). Obtain acetaminophen concentration at 4 hours post-ingestion or as soon as possible thereafter. 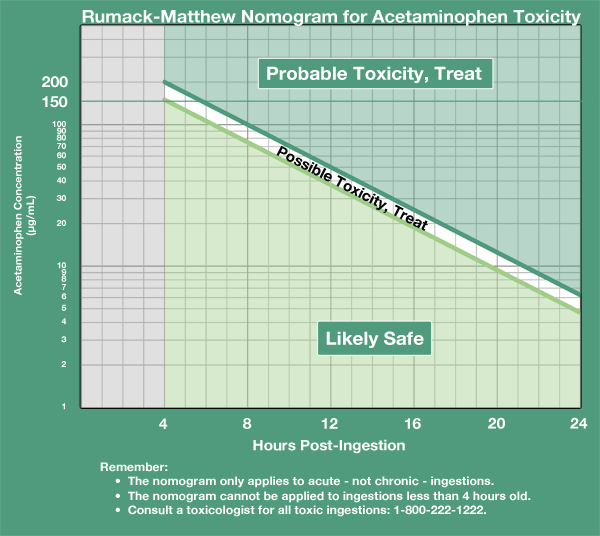 Plot acetaminophen concentration on Rumack-Matthew nomogram (see above). If above “treatment line” (line connecting 150 µg/mL (993 µmol/L) at 4 hours and 4.7 µg/mL (31 µmol/L) at 24 hours), NAC is indicated. Abnormal aminotransferases (AST or ALT). Obtain initial 4 hour post-ingestion acetaminophen concentration. If below treatment line, repeat acetaminophen concentration at 6 to 7 hours post-ingestion. If above treatment line, NAC should be initiated within 8 hours post-ingestion. Patients taking repeated, supratherapeutic (>4 g/day) acetaminophen ingestions. Serum acetaminophen concentration should be sent in all patients presenting with intentional overdose or those using excessive amounts of acetaminophen containing products. NAC treatment should be initiated within 8 hours post-ingestion to decrease risk of hepatotoxicity. Actual body-weight dosing, starting with loading dose and then variable rates depending on PO vs. IV, as below. Loading dose is 140 mg/kg PO, then 17 more doses every 4 hours of 70 mg/kg PO. If patient vomits within 1 hour of dose, it must be repeated. Loading Dose: 150 mg/kg in 200 mL of diluent administered over 60 minutes. Dose 2: 50 mg/kg in 500 mL of diluent administered over 4 hours. Dose 3: 100 mg/kg in 1000 mL of diluent administered over 16 hours. Loading Dose: 150 mg/kg in 100 mL of diluent administered over 60 minutes. Dose 2: 50 mg/kg in 250 mL of diluent administered over 4 hours. Dose 3: 100 mg/kg in 500 mL of diluent administered over 16 hours. Loading Dose: 150 mg/kg in 3 mL/kg of body weight of diluent administered over 60 minutes. Dose 2: 50 mg/kg in 7 mL/kg of body weight of diluent administered over 4 hours. Dose 3: 100 mg/kg in 14 mL/kg of body weight of diluent administered over 16 hours. Best if NAC started within 8-10 hours of ingestion, but may still be effective up to 24 hours after ingestion. May be given PO or IV. Oral formulation (Mucomyst, generic) 140 mg/kg orally loading dose then 70 mg/kg orally every 4 hours for 68 hours (17 doses). IV formulation (Acetadote, or using oral solution) 150 mg/kg over 60 minutes, then 50 mg/kg over 4 hours (12.5 mg/kg/hr), then 100 mg/kg over 16 hours (6.25 mg/kg/hr). Nationwide, multiclinic open study started in 1976 at the Rocky Mountain Poison Center, Denver, to assess the effectiveness of oral acetylcysteine in preventing hepatotoxicity in patients with acetaminophen overdose presenting within 24-hours of ingestion. 662 consecutive patients with acetaminophen overdose. 7% when treated within 10 hours of ingestion. 29% when treated within 10 to 16 hours of ingestion. 62% when treated within 16 to 24 hours of ingestion. 100 cases of acetaminophen poisoning treated with intravenous (IV) N-acetylcysteine (NAC). Serum acetaminophen concentration above a line intersecting 200 µg/mL (1323 µmol/L) at 4 hours and 30 µg/mL (199 µmol/L) at 15 hours. 0/40 patients treated within 8 hours of ingestion. 1/62 (1.6%) patients treated within 10 hours of ingestion. 20/38 (53%) patients treated within 10 to 24 hours of ingestion. Retrospective analysis of 57 patients treated with supportive care alone (no IV NAC) showed 33/57 (58%) incidence of hepatotoxicity. 11,195 cases of suspected acetaminophen overdose; described outcomes of 2,540 cases treated with 72 hour oral N-acetylcysteine. 6.1% developed hepatotoxicity when NAC was initiated within 10 hours of ingestion. 26.4% developed hepatotoxicity when NAC was initiated within 10 to 24 hours of ingestion. Rumack BH, Peterson RC, Koch GG, Amara IA. Acetaminophen overdose: 662 cases with evaluation of oral acetylcysteine treatment. Arch Intern Med. 1981;141:380-5. Prescott LF, Illingworth RN, Critchley JA, Stewart MJ, Adam RD, Proudfoot AT. Intravenous N-acetylcysteine: the treatment of choice for paracetamol poisoning. BMJ. 1979;2:1097-1100. Smilkstein MJ, Knapp GL, Kulig KW, Rumack BH. Efficacy of oral N-acetylcysteine in the treatment of acetaminophen overdose: Analysis of the National Multicenter Study. N Engl J Med. 1988;319:1557-62. 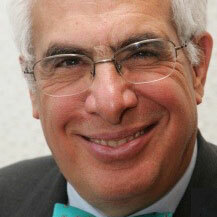 Barry H. Rumack, MD, is currently director emeritus of the Rocky Mountain Poison and Drug Center and director, Office of Professionalism at UC Denver. He is a retired professor emeritus of pediatrics at the University of Colorado School of Medicine.